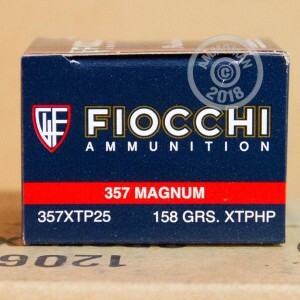 This .357 Magnum self-defense ammunition combines Hornady's tried and true XTP jacketed hollow point bullet with Fiocchi's expertise in manufacturing reliable cartridges. 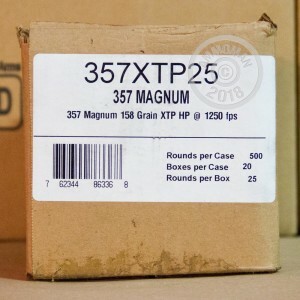 Each round in this box of 25 fires a 158 grain projectile at about 1,250 feet per second, delivering the "manstopper" punch that the .357 Mag is famous for. 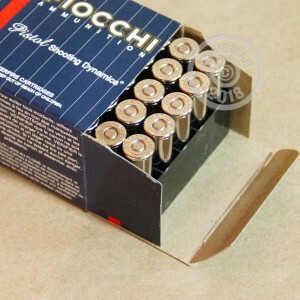 These cartridges come in boxes of 25 and are loaded at Fiocchi of America's facility in Ozark, MO using non-corrosive Boxer primers and brass cases. While certainly more expensive than FMJ range ammo, they are a great way to set up your revolver for self-defense without busting your budget. If you need some extra ammo to train with, AmmoMan.com can help. With free shipping for all orders over $99, we make it easy to get decent quantities of ammo without worrying about shipping calculators and package weights.